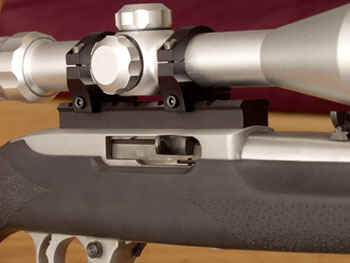 This Weigand mount matches the factory scope mount hole spacing so you can install in just minutes. Provides optimum height for the larger objective scopes now popular with the 10/22 crowd. Accepts most Weaver-style rings and accessories. Mount is 4- 1/2" long and weighs 2.0 ounces. Available in Matte Black or Matte Silver anodized finish. Mounting screws included (6-48 thread). Rings, rifle, and scope shown are not included.